What is Emotional Age? Where does it come from? Why do my moods and my behaviour patterns shift so quickly? What can I do about this? How can I change it? It doesn’t really matter what you call them. For thousands of years people have recognised that our moods and the energies inside us can change daily, hourly or even by the minute. The ancient Greeks and Romans tied it all in with their gods. The Greeks had a word for it “persona” meaning a “mask”. If we suddenly became angry we were wearing the mask of Mars the God of War and we thought and felt and spoke and acted from behind that particular mask. If we were feeling loving we were wearing the mask of Venus or Aphrodite, and while we wore it we were under her influence so we could talk and think and feel and act the way she would like us to. Acknowledgement: Several of the pages on this website including these notes were written jointly with my very good friend and Life Coach Jill Spring. Since then there have been many other ways of describing what we would call a shift in energies and emotional age. The general term is a shift in personality, a different mask, but that doesn’t help much apart from labelling what has happened afterwards when it is often too late! Call them whatever you like, “sub-personalities” is a useful term. Psychologists talk about schema, repetitive patterns, inner selves, inner families, and more, all apply equally well as labels for the same thing, that is our “emotionally younger inner protection systems”. If you would like to refer to the extensive bibliography on this site you can see the amazing range of books that have been published over the last 85 years using different names and concepts to help map and understand these different parts of us and accept that they are absolutely normal. We are all of us by nature made up of “multiple personalities”. They are natural and to a large extent functional. We could not operate without many of them. But equally significant are the sub-personalities, masks or persona that we sometimes wish we could live without, the ones that get in the way. I have been working in this area for 25 years and my conclusion is that the most practical and down to earth, non-academic way of looking at the more troublesome patterns (without giving them a negative label) is to describe them in terms of shifts in emotional age, understand more about them and learn to move from “automatic” shifts to manual grown-up self aware control. 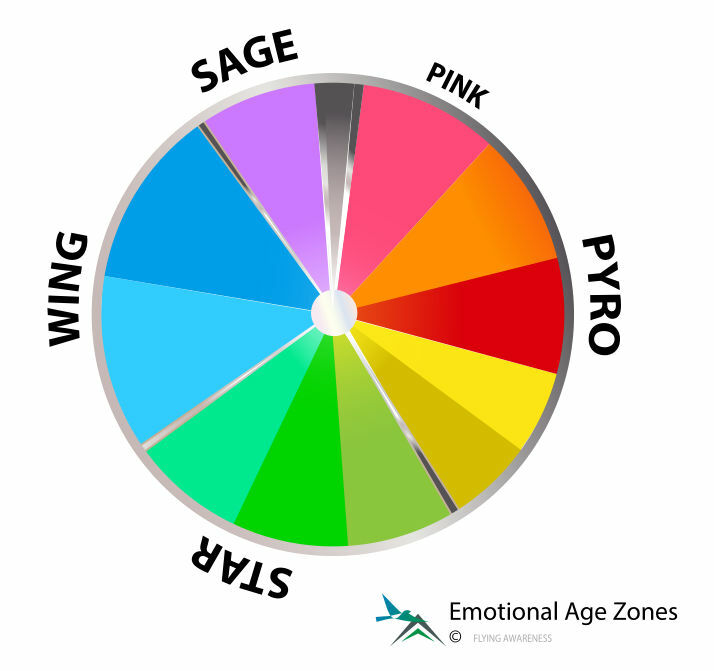 I am looking forward to talking with you about how easy it is to start using your own Emotional Age Color Wheel to make powerful changes in your life. On the page How emotional age affects your life I explain why we like working with the Emotional Age Wheel, particularly as we notice that most people seem to grasp this angle more easily than more psychological approach. We emphasis that no one is stuck with just one or two emotional ages. So many experts, even Oprah suggest that it’s just a matter of finding out where your particular emotional age might be. We believe that approach to be too limiting. Your emotional age is a dynamic constantly shifting energy. Which is why you need a Wheel to keep an eye on it every day. Replies to your short e–mail enquiries are of course free. We prefer not to do lengthy ‘question and answer’ sessions by e-mail. As a communication medium it is just too impersonal and I find it is better to have two way conversations where we can interact and work together. Bonus: Book and pay for four sessions in advance and your fifth session is free. Skype Package N-20 - One 20 minute session plus your choice of any one (1) set of Growing Awareness or Flying Awareness titles. Value over $50 (sent as pdf files) Total $30.00 USD. Skype Package N-100 - One 100 minute session plus your choice of any 10 Growing Awareness and Flying Awareness titles. Value over $175 (sent as pdf files) Total $115.00 USD. Skype Package N-350 - Five 70 minute sessions plus copies of any 10 or more Growing Awareness and Flying Awareness books (sent as pdf files) $355.00 USD. Bonus: If any session runs over the booked time there is no additional charge. No extra charge for EMDR.